This week’s goal was simple. What sort of healthy lunch can we make with the stuff on hand that’s in the spirit of fall (and has some of the flavors of the season), while still being relatively light, appeals to the kids, is inexpensive and uses a lot of what we had on hand already, and can easily be made in a large batch to pull out of the refrigerator in a day or two for a tight meal? I think we pulled all of that off with this one. These wraps make for a perfect lunch and can also accompany a stew or soup for the evening meal – in fact, I ate these wraps in both of these settings. They’re a bit sweet (from the peanut butter), but both fall-flavorful and fairly light at the same time. I’ll give Sarah a lot of credit here. She came up with these during some of her kitchen alchemy, where she just seemingly pulls out a bunch of random stuff and assembles a meal from it. 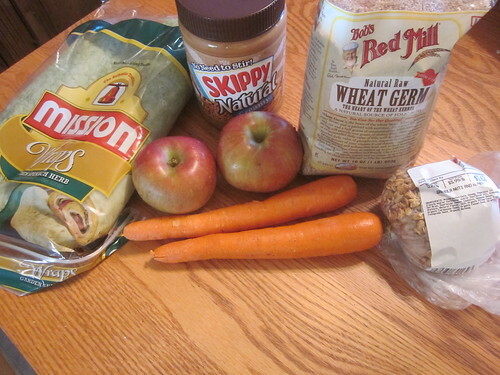 All you’ll need is some peanut butter (I’m honestly not sure how much – just get out a jar and a butter knife), some tortillas, 1/4 cup minced apple per tortilla, 1/8 cup shredded carrot per tortilla, 1/8 cup granola per tortilla, and 1 teaspoon of roasted wheat germ per tortilla. Roasted wheat germ is easy. Just spread out the wheat germ on a baking dish and pop it in the oven at 350 for about five minutes. Perfect. We were able to find all of this stuff on hand at our house except the granola, which we picked up for a few nickels at our local grocery store. The thing to do beforehand is to prep the carrots and apples. 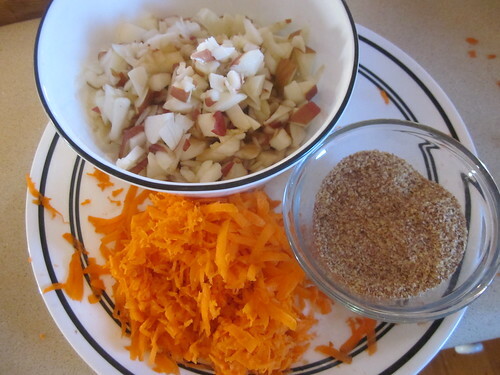 Simply chop the apples into oblivion and shred the carrots. You might also want to toast the wheat germ. 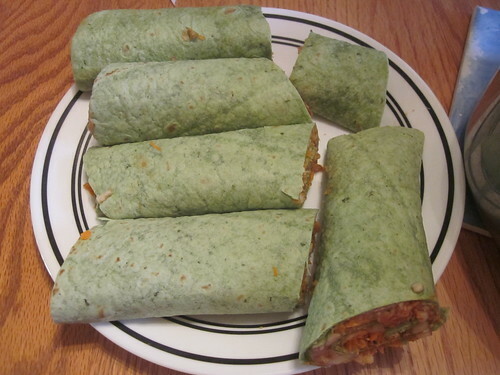 Of course, assembling the wraps is so easy that this is the real work of the meal. Lay out a tortilla in front of you. 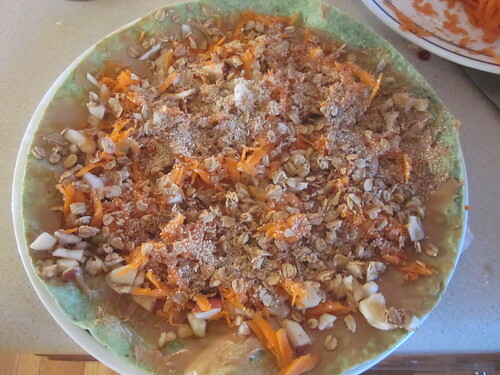 Cover it in a thin layer of peanut butter, then add the other ingredients as described in “What You Need.” Here’s what one looked like before wrapping. Once that’s done, simply wrap it up, slice it in half, and enjoy! 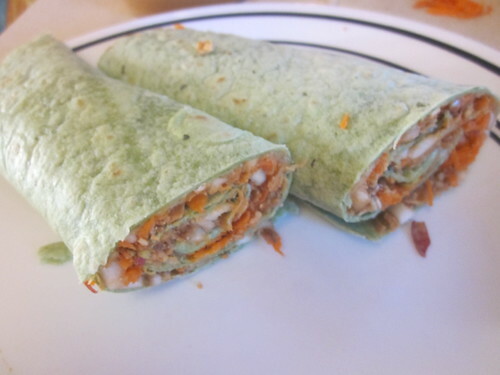 These wraps work as a standalone meal. They also work as an accompaniment to other foods, particularly soups. You can substitute other spreads for the peanut butter. In fact, the last time I made these, I actually used almond butter. You can try things like hazelnut butter as well, though it’ll make the wrap very sweet. If you want it less sweet, use cream cheese as the spread. For other ingredient substitutions, you can leave things out as you wish or used other vegetables as a substitute, such as shredded sweet potato.